Solving the land problem is the beginning of solving all social problems. (Ralph Borsodi, friend of and co-worker with Bob Swann, 1968). In the simple question of how we treat the land, next to people our most precious resource, our entire way of life is involved, and before policies with regard to the land will really be changed, there will have to be a great deal of philosophical, not to say religious, change. (E. F. Schumacher, 1974). Marie Cirillo lives and acts by these words. She has dedicated her life to freeing corporate land for the Appalachian people who are her neighbors. But land resettlement involves learning many skills—cultural, economic, agricultural, and those associated with civil culture—so of necessity Marie is involved with the complex web of an actual community in her efforts to resettle this Appalachian land. She is one of my heroes; I’m honored to welcome her here today. I would like to begin by saying that even though I have spent most of my life with the Appalachian people in pursuit of justice and liberty, we have not gotten very far in reaching our goal. But perhaps by approaching my story from a different perspective, I can convey something of that cold evil Andrew Kimbrell talked about earlier today; I can tell you what it’s like to live in a place where absentee ownership, which David Korten talked about in his lecture, is pervasive. But before I do that, I want to tell you how I met Bob Swann [founder of the Schumacher Center] because it ties in to my story. I am a member of the Federation of Communities in Service, founded in 1967 by women who work in the Appalachian region. 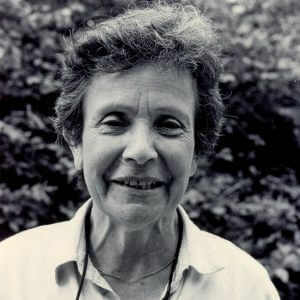 In 1968 one of our members, Monica Appleby, spent a year at Harvard. In the course of that year she heard Bob Swann talk about community land trusts. When she came back, some of her friends met in Knoxville to welcome her home. She told us what she had heard about the concept of the community land trust and said she thought it was perfect for Appalachia. We were so enthused, we each chipped in enough money to pay Bob’s plane fare for him to come to Tennessee. He accepted our invitation, and he spoke to ten or twelve of us about a way of having the community hold land in trust and lease it to people indefinitely to live on or to farm without having to buy the land. The lease fee pays for the land over a long period of time. Excited by what I had heard, I went back to my home up Roses Creek Hollow in the Clearfork Valley and told people there about what I had learned, but I must not have gotten the idea across. A few years later I invited Bob to come back and talk to one of the local organizations, and they didn’t quite get it then either. But by 1977 some people began to say yes to the idea of a community land trust. They said, “Aha! A community land trust might work. Maybe that makes sense.” This was partly because every time a project was brought to the stage where it was ready for a place to be housed, the group involved couldn’t find the land on which to build their needed facility. They had gone to the big companies, gone here and there, in search of land—with no success. First I mobilized the Regional Land Trust for Appalachian Communities. Its main purpose was to spread the word about community land trusts into rural areas like the Clearfork Valley. The people there were landless because the land had been bought up in the late 1800s for the coal that was needed as the eastern part of our nation was being developed. This explains the large amount of absentee ownership. I met many times with some local people before I asked if they would be interested in forming an organization and serving as its board members. They said yes, and in 1977 they found a forty-acre parcel of land for sale but had no money to purchase it. I approached the Regional Land Trust, and they knew how to mobilize funds and find legal council. They purchased the forty acres for $20,000 and then negotiated with our community land trust, which had incorporated as a nonprofit and taken the name Community Land Trust Association. Forty acres, as opposed to the 40,000 acres in the Clearfork Valley owned by the American Association, a British company. Not having the cash to purchase the land outright, the Community Land Trust Association knew that it could settle people on the land and collect land leases. The members calculated how many they could reasonably settle each year and then presented a payment plan to the Regional Trust. The Trust had received $7000 of the purchase price as a grant and offered to turn that into a grant to the local group if it would speed up the repayments based on its projection of land-lease income. The incentive worked. Within seven years the group was free of its debt. By vote of the local people its name was changed to Woodland Community Land Trust. We soon had questions about how to proceed, so I went in search of answers, thinking we could learn from other CLTs. And then I found out that there weren’t many of them at all! Somehow I had thought this was a movement I just hadn’t happened to hear of yet. Probably if we had known we were one of only five or six in the country, we would have been afraid to start. But we did, and I turned to Bob Swann and Susan Witt [executive director of the Schumacher Center] quite often for their thoughts and ideas. They have been real mentors for me. I must say that I can’t understand why the concept of the community land trust doesn’t catch on in Appalachia. It could be such a wonderful solution for the landless. To help you understand what life in Appalachia is like for the rural poor, I’d like to tell you a little bit about my life. I have spent fifty-one years with the Appalachian people. And because my first nineteen years were spent in Brooklyn, I am always asked how I got from Brooklyn to Appalachia. I could mention specific events that took me there, but mainly it was fate, a fateful attraction to rural life. My whole experience has been a wonderful mix of rural and urban living that has shaped my personality. The deeper I go into Appalachia’s history, the more I realize that the story of Appalachia’s rural poor is different from the story of the black slaves in the cotton fields; it is different from the labor abuses of the migrant farmer. Appalachia is clearly a place where the area and the people have been sacrificed for the sake of energy, and I think that’s what fits in with the idea of cold evil, although the connection between all the coal that has been mined as an energy resource and what has happened to our community is not obvious. One result of being exposed to poor rural communities was that I became aware of all the handwork done there. Your whole personal development is affected when you make by hand so much of what you depend on to live. It’s such a contrast to buying the commercialized products of cities and to the idea that you can’t get anything if you don’t have the money to buy it. Another result of my exposure to Appalachia as it relates to American history and my own family history has been a fascination with migration patterns. The move of rural people to the cities from the Deep South, from Appalachia, and from the Midwest, along with my mother’s move from Kentucky to New York and my father’s move from a rural community in Italy to New York, all told a story I wanted to understand. What was this all about? I wondered that from my earliest days, and as I grew up I began to understand that what I had observed—both in terms of migration and the predominance of handwork—is clearly related to development policies and land ownership. Whether it’s a capitalist or a socialist system, the design of a political economy that supports an industrial country shapes society. I have a sense from my own experience that as politics and industry were influencing our urban society, religious and educational institutions quickly fell into working cooperatively with both. I was born in Brooklyn in November of 1929, the month of the stock-market crash and the year the Depression began. I was twelve years old before my mother bought me my first commercially made dress. I can remember her sewing our clothes. She would always cut out a little piece of cloth for me to make a dress for my doll. Because my mother was from Kentucky and this was during the Depression years, she would take her four daughters there every summer. During those summers we would help tend the garden, preserve what came out of it, and help churn butter. We would enjoy the home-made ice cream. We would feed the chickens to get out of doing dishes. All of these activities were wonderful little experiences of producing what we needed. Grandfather would always help mother pack up the canned goods and ship them to our home in Brooklyn. So when this food arrived, I knew where it came from; I knew my grandfather had tended the garden and my grandmother had directed the canning. It was an important lesson in appreciating what we made ourselves, in developing survival skills, and recognizing our dependence on the land. I remember coal being delivered to our house when I was a child. The furnace was in the basement, and I knew how it worked. I saw the way my mother fired it up in the morning and banked it at night. When we got up in the morning, we ran to the radiator so we could get dressed next to its warmth. I didn’t know where coal came from, but I thought it must come from someplace special. Finding that place later gave me great satisfaction. Once again, I learned that something essential to our household came from the land. It took decades of living in Appalachia for me to understand the importance of the interconnection between urban and rural places. By 1947 I was a big girl and wanted to get out of the city. The way to do that was to join a group of missionary sisters. They were called the Glenmary Home Mission Sisters of America, and I was going to join them in their work in rural communities and save the world. As part of my experience as a missionary, I remember giving food away, giving clothes away, giving baskets at Christmastime, providing health services, and teaching in Bible schools. But I also remember valuing the fact that people were growing their own food and finding their own firewood and going to the railroad tracks to pick up pieces of coal. They were making quilts from scraps and their children’s clothes from feed sacks. I loved being with such people. I liked that identity. It connected me to my roots, to my deepest values. I also witnessed great generosity from the poorest of the poor. They, like the land, gave generously of what the Earth gave them. When I fell in love with Pond Creek in the southeastern corner of Ohio when I was sent there as a Glenmary Sister, I knew I would never leave rural America. In 1967 I left this order of missionaries with forty-three other women who wanted to continue working with the Appalachian people but not within the institutional Church setting. We formed a nonprofit group and called it the Federation of Communities in Service (FOCIS). It was then that I moved from the immigrant neighborhood of uptown Chicago, where I had spent the past four years, to a place called the Clearfork Valley. I have been there ever since. Ninety per cent of the people from the Clearfork Valley had left since the 1950s. One of the things that attracted me to it was the fact that the 10 per cent remaining were still part of those other societies of hunter-gatherers and of agriculture, even though they had also become part of today’s industrial society. The Appalachian people I know live in all three worlds. What they understand as industrial society in their mountains are the corporate extractive fossil-fuel industries, whereas those who left for the cities have been exposed to factories, which are more typically understood as part of an industrial society. In any case, the real truth of the lived experience of people in the Clearfork Valley, as opposed to the stereotyping of backwoods mountain people, continues to fascinate me. The Clearfork area is made up of twelve unincorporated communities located between the towns of Jellico, Tennessee, and Middlesboro, Kentucky. When I arrived there, the company towns had been dismantled, mainly because of the shift from deep mining to strip mining as new technology made that possible. Big machines now dug the coal. Production no long required people, so the companies tore down the miners’ homes because they no longer had to provide housing. That was when people realized for the first time that over the years the companies had bought up most of the land. Because the company towns had been dismantled and the county political system had little history of being involved with anything other than roads and schools, it was clear that change would come only from if people were willing to make it happen themselves. My work since 1967 has been to help people organize their own community-based nonprofit organizations. Together we have organized for health clinics, small business enterprises such as craft production and industrial wood pallets, child-care centers, and other service programs. We did some organizing to address land issues, which at that time centered around coal production, taxes on coal, and environmental concerns about strip mining. In those days hardly anyone was aware of environmental matters. If Appalachian people spoke in public about the environment, it was as though they were talking to a brick wall. No one knew what it was all about. Even today, most people still don’t make the connection between urban consumption, with the resulting environmental problems, and rural production, with its different but no less serious environmental problems. I found it significant that 90 per cent of the land was owned by absentee companies and about 90 per cent of the population had fled. This made me think that the local people’s plight must be related to the fact that they didn’t own land. And I began to understand what we were going through as a leading industrial society. With three million blacks leaving the Deep South for the cities in the 1920s and 1930s and three million Appalachians leaving for the cities in the 1950s and 1960s, and who knows how many farmers leaving the Midwest for the cities, this country experienced the largest rural to urban migration in the history of the world. And we didn’t even realize it! It took me a while to get smart and learn from my own experience. I came to appreciate my community as the most valuable classroom of all. I never got tired of being there because I was always learning something new that I had never learned from college textbooks. E. F. Schumacher said that in order to turn potentiality into reality, the task of education must be first and foremost the transmission of ideas, of values. This impressed me. Popular books about Appalachians such asYesterday’s People suggested that anyone who had any get-up-and-go got up and went. But I found that the few who stayed had good reasons for staying. They might be cash poor, but those I met and began to work with were people who chose that life-style because of certain values they held. I was familiar with some of these values from my own childhood experiences and also from what had been transmitted to me by my mother, from whom I learned a love of beauty and the creative capacity of Earth, and my father, who instilled in me a love of music and history. What drew me to the Glenmary Missionaries in 1947 was the call to convert the rural people who were moving to cities in huge numbers; if they could be brought into the Church before they moved, the urban churches would benefit greatly. The Catholic Church was basically an urban church, and Glenmary’s founder felt that it was lacking something that rural people could provide. If Glenmary could give something to the mountain people, then when they moved to the city they, with their strong values, would give something back to the Church. Many years later I came to see this principle of giving to one another as the basis for the partnerships we developed in the Clearfork Valley between churches and community-based organizations, between colleges and community-based organizations. My four years in Chicago, where I spent my last years as a Glenmary Sister from 1964 to 1967, brought a rude awakening. People did not welcome hillbillies into their community. They didn’t even want them as part of their church. And as a matter of fact, many of the migrants didn’t want to be in Chicago. They would often return home to try again, only to come back defeated. They had no choice but to get a job in the city, where neither church nor community welcomed those I had come to love. When I left Glenmary and helped found FOCIS, we made a commitment to the people who had decided to stay in their rural place. Not that we were against those choosing to leave, but we cared about those who stayed, and we wanted to build our life with them. It was interesting that in the 1960s so many people were joining communes. I didn’t feel I had to do that. Appalachians had their own ready-made communities. If they would just accept me into their way of living, I would find community. They did, and I did. Though I didn’t realize it when it was happening, a bonding experience took place between the FOCIS members and the Appalachians living in the area of the coal fields. I was one of over 103 of 120 Sisters to leave the order. Many left singly, whereas forty-four of us left to continue our work with the Appalachians through FOCIS. Like us, the Appalachians scattered as they left their rural home place. Some went on their own while others moved with their extended family to places such as Cincinnati, Detroit, and Chicago. And like us, they remained in touch with those they had left behind. Both groups had the experience of being disrupted by the system we were living in. I read in a recent United Nations publication that there are 23 million people experiencing internal displacement within their countries today. So the system is still promoting this kind of diaspora, still causing the breakdown of rural society and the loss of roots. The personal growth I have experienced during my thirty-three years in the Clearfork Valley is very important to me. For the first ten years I was feeling my way around. What I did was help people organize to provide services. That was good; it empowered people. They learned how to work together to reach their goals, to sustain their work. and to stay within their financial limitations, having to do without. Then, in 1977, new ideas took shape in our collective mind. It was after the massive floods of that year, and even the few people who remained in the region were losing their homes to flood waters. Federal officials from Housing and Urban Development were shocked to find that there was no available land on which to resettle people in the emergency mobile units they were bringing in. The governor of West Virginia used his power of eminent domain to take corporate lands to house the homeless. It was time to start talking about community land trusts as a citizen approach to the problem. That was when we founded our own CLT. Something else happened in 1977: a number of our women’s groups (most of the nonprofits were run predominantly by women) formed a coalition called Mountain Women’s Exchange, which was later incorporated. The question was raised, What is it that each of us needs but can’t get on our own? The groups agreed on the answer: a college education. So we mobilized and were able to contract with a college to come in and offer the courses we thought we should take. That was also the year when we organized a five-county anti-strip-mining group called Save Our Cumberland Mountains. These endeavors continue today, still with the same vision. In the 1990s more groups and projects came into being. I’m sure they had been germinating in our heads for some time, but I credit their realization primarily to the community land trust. Once we acquired land, once we had a plan for its use, and once people settled on it who had a consistent ethic about land being held in trust, we began to care for it, to share it, and to distinguish between public and private land. This is what led to new developments. One of the new groups is the Forest Visioning Circle, which we started partly because of Champion Paper coming in and buying 80 thousand acres to clear-cut for chip mills. Another group we called ABCDE, which stands for Appalachian-Based Community Development Education. We are a network of grass-roots organizations from the Appalachian areas of Kentucky, Tennessee, Virginia, and West Virginia. We get together in Middlesboro, Kentucky, to plan our strategies, and we try to recruit college students to join us in the summertime to help. We also organized a women’s group named Economics in the Clearfork Valley. We meet every Monday for lunch to discuss what is going on in the county court, the schools, and the county in general. This group came out of the Woodland Community Development Corporation (WCDC), which the land trust started in 1987 when it was seeking others to take on housing so it could continue to focus on the critical land-acquisition issue. We had been spending too much time trying to provide housing and mortgage financing. WCDC had worked on housing issues for quite a while. It built commercial houses but soon realized that nobody could afford a commercial house, and no bank would give a loan for such a building, so it initiated a project with a group of seven people to work on what they called the Native Material House. They had observed how poor folks built a house. They cut the logs, they brought them to the sawmill, they built as much as they could. Then when they got more money, they added another window or put sheet rock in another room. So the Native Material House tried to combine these people’s way of building with conventional housing construction. WCDC offered two families a little bit of money to help with the materials they had to buy in return for coming and meeting with the group of seven every other week to explain what they did. WCDC wanted to find out how much they called on their family for help and how much work they traded, such as someone putting in the wiring in return for having a car repaired. These activities have given the community some clear messages about the real economy—one that doesn’t have everything to do with money. It’s been fun. Building does come to a standstill once in a while until a new impetus comes along to get things going again. In addition, WCDC supports families in generating income, making use of the Grameen Bank model (the peer micro-lending program that originated in India) and one called the Individual Development Account. This is a new program introduced around the time welfare reform went into effect. People in leadership positions were telling the government that poor people cannot get out of poverty if they do not have assets. As a way to gain assets the program recommended establishing small savings groups of from five to ten people, who would meet every other week. They would bring in a little bit of money and put it in a savings account. Then when they were ready to take it out for a house, a small business start-up, or educational purposes, the sponsors of the program matched the savings two to one. Hence, instead of having $2000 to start their house they had $6000. We also have a spin-off of local currency. We never succeeded in putting a full- scale currency in place; with little more than a general store in our area, everybody has to go to town to shop. We have neither the funds nor the talent (to our knowledge) to initiate this unfamiliar kind of service. But we did start something similar called a Community Investment Certificate. My concern was that if we teach people how to develop their personal assets through the Individual Development Account program, we also should promote the idea of communityassets. People need help in finding ways to make their contribution to building up the assets of the community. An old school building in Eagan, which is approximately in the center of the Clearfork Valley, was given to Woodland Community Land Trust, but we didn’t have money to renovate it. I tried to recruit volunteers, telling them they would be helping to build a community asset. This new group is being organized to manage the renovation for a community learning center. People will be given Community Investment Certificates for the volunteer hours they put in. Then, when the center opens, activities that cost money can be paid for with these certificates. Those were the exciting things that emerged between 1977 and 1998, a period of development that had reached a new level beyond that of the previous ten years As local people were taking these initiatives, land in the Clearfork Valley was changing hands as the use of natural resources was shifting. The 40,000 acres held since the 1880s by the American Association, Ltd., the British absentee land company whose interest was coal, was sold in the 1980s to the J. M. Huber Corporation of New Jersey, whose primary interest was timber. Now the land is being sold once again. The present change of ownership being negotiated leaves citizens in the dark regarding their fate at the hands of yet another absentee landholder. Even though we know that the interest today is more in timber, we see that there is still some coal, gas, and oil being extracted locally—although the coal is almost gone. Compared to other Appalachian states Tennessee has only a small portion of the region’s coal, and what remains is of poor quality. Better-grade coal is coming from the West, but we think someday when that runs out, the companies will come and take ours again until it too runs out. We continue on with the idea that we have nothing to lose by trying to stretch our minds. The new millennium has provided some added momentum for us to think boldly about the future. Change is coming. The cheap energy that built our industrial society is running out. The American Association had flatly denied the requests from local organizations to sell or lease a bit of company land, refusing even to enter a lease agreement for a half acre that the Clearfork Clinic needed to build a facility. Nor would the company consider a request from the Model Valley Development Corporation (founded in 1970) for land or access to timber when it was trying to build an industrial wood pallet factory. The J. M. Huber Corp., on the other hand, donated twenty acres to Model Valley Development in addition to the Eagan school building with its twelve acres, which were then transferred to Woodland Community Land Trust. We regarded this as progress! All of the old schools of the coal camps have been torn down except for the one in Eagan. When it was turned over to Woodland Community Land Trust in 1999, the school was pretty dilapidated. The roof had fallen in, the windows were all broken, the pipes were broken, and sheet rock had crumbled away. The Huber Corp., which owned almost all the land in the valley, wanted to get rid of this building. They either were going to tear it down or give it away. Woodland was the only group interested in it. The management tried to interest other groups because, as a for-profit land company, they did not want to donate the twelve acres and school building to what they thought the owners might perceive as another land company, even if ours was not for profit. At one point in the negotiations, Huber sent some of its people to see us. They listened and even seemed to understand our efforts and concerns. We were delighted to see them face to face after all these years of not knowing the major players in this community. The Huber Corp. decided not to give the school to our CLT, but through quiet negotiation we arranged for the Model Valley Development Corporation to accept it as a gift and then turn it over to Woodland. Huber did ask for $5000 to cover legal and surveying costs. The land trust raised this amount and paid it to Model Valley in 1999. We received the land and building just a year before the new millennium, which meant that our visioning included what a building like this could be used for. We spent a good bit of time thinking that through until it became apparent that what people wanted could be organized within a learning center. We came up with the idea of a Clearfork Community Institute, which would promote sustainable economics and community-based education. We also wanted to focus on spirit/culture—what do we value, what do we want for our families and our community? Until now, Woodland CLT has been leasing land for housing—thirty acres out of the 200 it now holds in six separate parcels on Roses Creek. Some of the thirty is being used as common land for family gardens, play areas, or whatever is agreed upon by the residents. The remaining land is being managed as undeveloped forest. Now Woodland has a new facility that will be suitable as public space for the larger Clearfork Valley community. We will be able to manage land and buildings for the common good. But creating a public space in a community lacking local government and a local tax base brings with it both financial and governance challenges—challenges we are ready to meet. We withdrew the $10,000 we had collected from partnerships established with churches over the years. We were given a $50,000 line of credit with a local bank, thanks to the help of eight friends who purchased certificates of deposit to be held by the bank as collateral for three years. By the time the certificates matured, Woodland had raised enough money through donations to repay the bank all that it had withdrawn, and the eight friends got their money back. We bought that land with the idea of devoting ourselves to restoring it. There is no way for this area to revive itself as a rural community dependent on natural resources if we don’t commit time to healing our place on Earth. A special boost was given to the life of our region and our community by the Bonner Foundation. Mrs. Bonner, who is ninety-one years old and chairs the Foundation board, was born in Eagan when it was the Blue Diamond Coal Camp. Her father worked as a miner for Blue Diamond. When she came to visit, she give us $50,000 to put a new roof on the old schoolhouse. With offices in Princeton, New Jersey, the foundation gives scholarships to college students, mostly to low-income youth in the South, including Appalachia. All students who receive a scholarship must agree to a certain amount of community service. Mrs. Bonner would love to have us develop a program for students to come and work with us. This would mean that the interaction between young people and the community has a future. Those working to establish the Clearfork Community Institute like to think of the Clearfork Valley as a community that has something to teach because of its rural life-style, its struggle to keep that alive, and its experience with urban migration. There is an unfortunate disconnect in our nation between rural and urban life, and it is encouraged by our education system. Urban people like to go to the country, admire the scenery, take a walk in the woods, but that’s not helping to keep a rural community and a rural life-style alive. It disturbs me that so little is being done to address this separation. I hope the service component of the Bonner Scholars Program will play an important role in whatever we do with the old school building in Eagan and will also help provide colleges with a meaningful curriculum linking the urban and the rural environment. With these general areas of concern in mind, we started looking at the new initiatives to see if they fit in with our goals for an institute. Can we do enough? Can we generate enough income to keep the doors open? Right now we are at a standstill in that regard, but the hardest part was getting the vision in the first place. Another important development resulting from activities among grass-roots community-based groups is that over the years connections have been established. We created partnerships that established five-year commitments from both partners. We also linked with strong networks that emerged: one of them is called In Praise of Mountain Women. Every other year women from the region come together for a weekend. The main part of the agenda is to honor what we have accomplished and what we are struggling for. This might not seem like much, but it’s important to gain faith in yourself when the rest of the world thinks you are just a poverty-stricken, backward person. There’s also a Tennessee network called Women in Self-Sufficiency, whose members are primarily from low-income neighborhoods and are working in community to improve their lives. These women appreciate what our community land trust has accomplished, and we appreciate what they are doing. It’s a good connection. We are part of the National Congress of Neighborhood Women, made up of grass-roots groups from low-income urban neighborhoods and poor rural communities of the United States. We get together every year for a week-long institute. Don’t ask what we eat or where we sleep, but we manage to get there. You have to spend the whole year saving your money in order to go to the institute for a week. And when you get there, you’re exhausted from the preparations to leave home—finding someone to take care of the kids and preparing enough food to last while you’re gone. The first day we always spend catching our breath. So it’s not moving very quickly, but we are not going to give up. We’ve stayed together for twenty years because we have important work to do. We’re hoping that enough good things will come together to spark a flame. Because the National Congress of Neighborhood Women is an official nongovernmental organization (NGO) we’ve learned about activities at the United Nations and have gotten in touch with grass-roots women in other parts of the world. Now we have a small but wonderful organization called GROOTS, which stands for Grass-Roots Organizations Operating Together in Sisterhood. Of course with the internet we are making even more connections that are helpful and extremely enlightening. All these women’s groups comprise my main connective system. There are other good ways of being connected, but I guess my own history of coming from a family with four daughters and joining a convent of 120 Sisters, forty-four of whom then organized FOCIS, determined the route I have traveled. I want to say that the support of our hopes and visions by women like Susan Witt has played an important role for grass-roots women. It hasn’t all been fun, nor has it all been struggle. But it certainly has been a challenge to try to slow down the runaway system of outmigration, the loss of roots, the alienation of Americans from the land as prime resource, and the dwindling of skills that sustain a rural society. What keeps my feet to the fire are the wisdom and values of mountain people. Home is much more for them than the walls that provide shelter for the family. Home is the physical, geographic place in a natural setting where they and their friends become part of the larger living community. It is a microcosm of Earth. The place-based community is extremely important to us, and together we do what we can to resist the ways in which society tends to disconnect us from it. Unfortunately, industrial development has worked against many aspects of a rural community, and much wisdom has been lost in the process. People’s ability to hold on to values that sustain rural communities is at risk. The oppressive control over rural people by an urban mind-set has been hurtful to them and also dangerous for our country as a whole. When a society loses consciousness of its dependency on natural resources, it becomes wasteful of them. (I’ve heard said it would take three Earths for everyone to have as much as we in the United States have.) Often the people are wasted along with the resources taken from a place-based community such as ours. Then a nation loses its wealth and its soul, and the nation deteriorates. This is what challenges me to keep working to sustain rural communities for America. The desire for change expressed in the popular vote has no effect on the Tennessee state government. Agencies like the federal Tennessee Valley Authority (TVA), created in 1933 to develop cheap electric power, and production systems like the nuclear conglomerate for atomic research in Oak Ridge can easily exert theirinfluence on state government and Tennessee’s universities. One of the hardest things for me to accept is that during my thirty-three years in the Clearfork Valley, in spite of all the efforts and struggles of the local people to accomplish something in their communities, the state Office of Community and Economic Development has not given us one penny—except on the few occasions when we had enough energy to mount a political fight. They just want us to move away to a city. They say it’s not economically efficient for us to live there, and they find excuses to justify the government’s lack of assistance to most rural communities of Tennessee. In that context I want to say this hasn’t been the case just during my years there; it has been a whole century of living with industrialization and urbanization that resulted in the Appalachian people’s present plight. During the first half of the twentieth century the federal government chose to sacrifice our region for the sake of expansion of the cities of New York and Boston. The East Coast was built with our timber and heated with our coal. There is no feeling of responsibility for what was taken from us, nor has there ever been. But we are still living with some of the consequences of being made to serve other areas so they could be developed efficiently. And when World War II came, what else was there except to win the war? Our government chose Oak Ridge as the place to conduct research to develop a new kind of bomb to do that. Who cared about our beautiful mountain region and the special people it gave birth to? We were chosen to be sacrificed. It’s easy for people to forget now that it’s over, but we still live with that memory. From an earlier perspective, many of the people are of Cherokee origin, and they still live with the pain of having lost their land. Sometimes jokingly referred to as the secret society, TVA and Oak Ridge are part of that system Andrew Kimbrell associated with cold evil, a system that needed our coal to build the East Coast, to win World War II, to move us into the post-War era of fossil fuels and then nuclear power. The proliferation of cars and plastics made possible by fossil fuels caused industries and cities to grow beyond all predictions. Rural America lost in big ways: the Clearfork Valley lost its population, lost its coal, water, soil, trees, and wild life. And yes, we almost lost our spirit. We have to deal with that cold evil. If we try to challenge these powerful institutions, we don’t fare very well and are not treated very well. Those of you familiar with the history of Appalachia know that the army has been called in to stop union strikes. We have had our people disappear, but you never hear about that on the news. I have certainly lived with harassment and threats and burning as have many others. In the past year and a half our community land trust has lost seven of its seventeen buildings to arson. Our development efforts are not supported or viewed with favor by those with money and power. Tennessee is a special part of Appalachia. It is unique because of TVA and Oak Ridge. But I am fighting on behalf of all of Appalachia in my work in the Clearfork Valley, where we have lost 90 per cent of our population, where 90 per cent of the land is owned by absentee landlords, and where our water has been polluted, our land ruined. I’m not letting anyone forget that. What place is going to be sacrificed next for the needs of the industrialized world for which America serves as the model? It took us 40,000 years to move from a hunter-gatherer society to an agricultural one and 10,000 years to move from an agricultural society to an industrial one. In less than 1000 years our industrial society already seems to be falling apart. What comes next? Whose vision will move us forward? It is a changing world, and we have no clear answers, but I do think the interactions between the poor and the rich, between rural and urban, North and South, whites and people of color, male and female are very important. We need to keep connected as we try to find our new interactive relationship with Earth. Human relationships are only part of what needs improvement; Earth calls for a better and broader-based relationship with all that is—with all that sustains life. It is an operating principle for me not to think in terms of either/or. It is not science/technology or indigenous knowledge. It’s how you connect the two so you can have the proper balance. It’s not capital or labor. It’s not commercialism or do-it-yourself production. It’s not poverty or wealth. It’s not a rural life or an urban life. It’s both/and. We in the valley know we are a small place, and much of what Schumacher says in Small Is Beautiful makes sense to us even when it contradicts the thinking of the big corporate enterprises that overshadow our community efforts. People everywhere need to gain an appreciation for the fact that small and big both have their place. It is not an either/or. The fact is that both can be right or both can be wrong, according to the principles we choose to live by. As we were being told how the new system works, there were questions from the audience: Is there any concern for labor? If you hire ten or twelve people, are they going to be protected? Is there any concern for environmental protection? The quick and decisive answer was that profit is the bottom line. So now we have the little guys doing exactly what the big guys have been doing all these years. This is entrepreneurship American-style. I could hardly believe what I was hearing. Recently I’ve heard about a curriculum on entrepreneurship for grades K- 12. I’ve got to get my hands on this curriculum to see what our children are being taught. It’s frightening. I want to keep attention focused on the migration in and out of cities. Why? Because what happened in America is now happening globally. According to a United Nations report 23 million people are experiencing internal displacement within their countries today. In May of 1999 I had the privilege of going to the United Nations seventeenth session of the Commission on Human Settlements held in Nairobi. I was one of the official government people, so I got to sit in on the preparations for each day. GROOTS, the women’s network, was participating as an NGO, and I would meet with them at night in addition to meeting with the government people during the day. The Commission determined that one of the major problems over the next twenty years will be massive migrations worldwide. It’s estimated that in twenty years 70 per cent of humanity will be living in cities. Two major related issues are the impact these migrations are having on governance and land tenure.My most significant contribution during the government meetings was to say, “You know, this trend started in our country; maybe we should look back to see what we have learned and share our insights.” People agreed, but I don’t think they gave it another thought. I did find it confirming, though, that others, including our government, shared my concern over migration and recognized the land problems it is causing in both the cities and the rural areas. I want to find allies. The speakers and the audience here today think the way I do, but where can I find others who share our views? I read an interesting article in the newsletter published by Harvard Divinity School. A visiting professor, a city planner from Korea, was describing his vision of the future: ten or fifteen cities throughout the world will bear the highest impact of people and their urban life-style. Surrounding the city will be an agricultural circle and beyond that another circle with the hunter/gatherer or wilderness area. Each of these cities, comprised of all three elements, will be one nation. It sounds crazy, yet whoever starts visioning something new sounds crazy to some but has a kernel of truth for others. In our search for a future way we should remember that there is a need to link those three different modes in meaningful ways. I know that the many who have moved from Appalachia to cities are still connected to the mountain people.Community land trusts are one way of making the connection. The land trust movement has been growing in urban centers. The Dudley Street Neighborhood Initiative in Boston is a marvelous example of how the appreciation for land can be expressed in the city. You are not just getting land for your house; you are getting enough land to live, to have a garden, to play, to have a small business, etc. When land is put into trust, it can have a central integrating impact in shaping a new community. I want to help make Appalachia a place to learn in the new millennium. The Clearfork Valley is ready to identify itself that way. With our community-based organizations, our land and people, our rural values, our knowledge and skills, we have a community from which both rural and urban people can learn. We are presently holding a building and a mountain for this use, but we need supporters, and we need to raise money. We are hoping to form a partnership with urban counterparts to develop the Clearfork Community Institute as a regional center for creative action that will integrate our private and public lives into Earth life.We are depending heavily on community-based organizations to be integral to the learning experience. Our newer groups—such as the Forest Visioning Circle, Earth Day Celebration Committee, the Native Material House, Appalachian-Based Community Development Education—and our connection to colleges with their service-learning and participatory research interests have shaped the vision. Both service learning and participatory research provide our community with an opportunity to take the lead. The students involved learn as well as teach, even as community people learn and teach. The community becomes a place of learning for both residents and students. The process of breaking down barriers based on differences of class and place while building up a sense of interrelatedness can begin.We have friends in churches, in colleges, and in foundations. We have begun to approach local timber and energy-based corporations. We are seeking individuals and institutions to partner with us in developing the Clearkfork Community Institute. When asked by Vice President Gore what I would do if I were President, I said I would work for land reform. And what would land reform look like? I have learned from my international network of peers that forced land reform by governments generally doesn’t work; it backfires on the poor. I think we in Appalachia need dialogue among community groups and corporate land owners to come to a better understanding of the both/and rather than the either/or attitude. Is there not room for all of us? Is there not value in doing land-use planning together?The community land trust model demonstrates how residents can empower themselves through a proper relationship with the land. The model adopted in Voi, Kenya, has been listed in UN literature as a Best Practice. Our Woodland CLT fulfills the needs of the landless poor. It is trying to do exactly what the United Nations says the agenda for every nation should be—to further adequate governance and expand land tenure. The answer cannot be one set of rules for the 30% left in rural area and another set of rules for the 70% in urban areas. The challenge for the new millennium is to make life whole. We must never forget that rural resources are essential to building cities and that it will take wise people to keep these resources healthy and productive.If land-holding companies would turn over some of their land to a community land trust such as Woodland and work with us, together we could shape a local and global economy that would serve the best interests of present and future generations as well as the present and future needs of Earth. And if we could persuade government to put money into paying citizens to reclaim the lands that have been ruined in the twentieth century, it would then be up to the people who are Woodland partners (individuals and institutions who pledge to contribute to its land-purchase fund for five years) to work with local leaders in creating the Clearfork Community Institute, where sustainable economics can be promoted, community education can be offered, and spirit/culture can be promoted.If we ever receive federal funding to restore the land and empower the people of this community, we will need to have a strong enough foundation to prevent government from taking control of what our people are learning and to ensure that this learning gives them a role in the policy-making that affects their lives. Values having to do with community and sustainability must not be violated as local people are trained in ways to generate income. As land is restored by local labor and then developed, the people doing the work must be involved in deciding which of the restored lands are appropriate to allocate to homesteads and which to commerce, industry, agriculture, and hinterland. Eventually the circles of agriculture and hinterland (in our case, forestland) surrounding human settlements will be in better balance with urban interests. Located as it is in a rural area in a predominantly urban society, the Institute can become a center for addressing the critical need for a better balance between rural and urban land use and development.Community learning centers such as the Clearfork Community Institute can help urban as well as rural settlements see more clearly that they are part of one experience, one consciousness. Communities have the potential to unify the many accomplishments of a new social, economic, and political order. Land-tenure policies will have to change to accommodate the reshaping of rural and urban societies. There must be a consistent ethic to support a holistic vision for Earth that values the diversity of its parts. The attitudes of humans will change significantly during this time of transition from an industrial society to the yet unnamed society that will replace it. In conclusion I would like to say that Appalachia, with its land and its people, has the potential to make a significant contribution to our changing world. To do this the region needs to expand its network to connect with other already existing networks. It is with this possibility in mind that I am grateful for the opportunity you have given me to share my story with you. Bob Swann and Susan Witt have been a great source of strength for me. I see you as their friends. Thank you Bob, Susan, the Schumacher Center, and all of you. When you’re so inundated with images from TV and the commercial signs in towns, it’s hard to get enough distance to imagine how you could live differently. But there is a different set of values in Appalachia—in the people who have been left behind, those who are there because they have a life-style they insist on keeping. They haven’t learned how to express it, but they do know it deep inside. One of the ways I can help these people is to put into words what I know they believe and love, and then they say yes, yes, yes. Over a period of one hundred years our forests have been ruined, and it will take at least thirty years to put life back into those lands. We need help to do it. We need to be paid for doing the work that must be done to give something back to the mountains. I think we could generate income if we once got started; then people would come to learn with us. Maybe we could get money to pay those people to help us restore the land. But no one wants to spend time on restoring company land because the companies will just exploit it all over again, We’ve seen that happen right in our back yard. TVA comes and does a big reclamation project, and five years later the company digs a little deeper for coal and tears the land up again. So we need to make sure that doesn’t happen. I have always felt that a community was there to take care of its needs, and then the surplus would be shared with others, just as the surplus of others would also be shared. But in our case everything has been taken from us; there is no surplus. If there is no way to stop the harmful impact on our region of the mining companies or the trade organizations like the North American Free Trade Agreement, it’s foolish not to have some back-up security for the times when things break down. If a community doesn’t have something like community-supported agriculture or a source of firewood, just imagine what could happen. When you think of the worst scenarios, such as power failures in New York City or water scarcity reaching crisis proportions, it’s frightening. That’s why I think it’s so important to encourage the rural/urban connection and the sharing of resources. David Korten compared large farms with small farms. The extent to which fossil fuels have contributed to the big farms is hardly ever mentioned. Our folks ask, “When the fossil fuels are all gone, what’s going to happen to us?” We realize how much the industrial world depends on fossil fuels. We live in a place where we see resources going, going, going. When I first moved to our community, everybody heated with coal. Then when coal was taken over by bigger corporations and it was transported further away, we couldn’t even get coal, so we changed to wood. Now that Champion Paper is there, they’re clearing the woods, and we’re asking, “What are we going to heat with?” We’re facing these realities, maybe a little sooner than others. A striking connection for me was when Andrew Kimbrell talked about the totalitarian state. In our area, where we know there’s collusion among TVA and Oak Ridge and the University of Tennessee, we call it the secret society. I want to mention, in terms of the interfacing of our different stories, that I’ve heard several theories about how revolutions happen. The one that makes the most sense to me is that revolution comes about when the intellectuals and the poor people get together. That takes a lot of trust on both sides and a lot of patience because we have different ways of expressing ourselves. My people don’t talk about a totalitarian society; they talk about a secret society. And they don’t talk about agriculture in the same way either. If we can be patient enough to listen to one another and realize we’re saying the same thing in different ways, I think that can lead us to finding solutions.